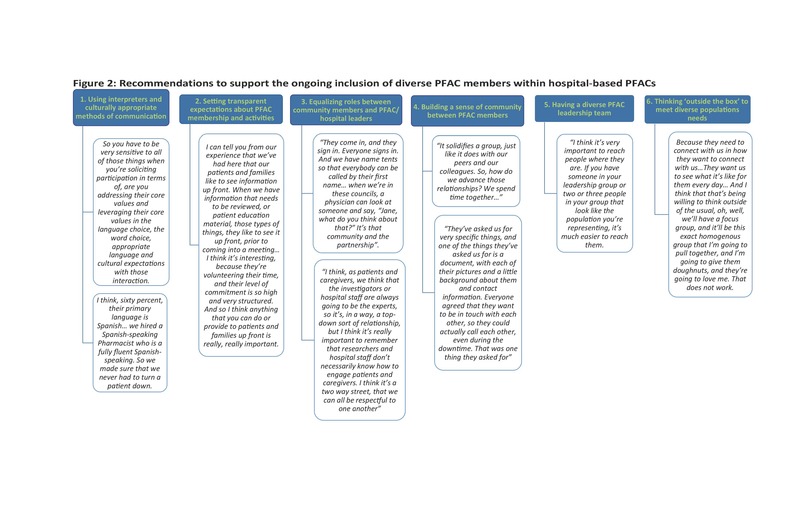 Background: Ensuring hospital-based Patient and Family Advisory Councils (PFACs) include members from diverse, vulnerable and underrepresented communities is important to ensure that all voices are represented and heard when providing input into hospital quality improvement and research efforts. However, ensuring diverse membership of PFACs remains a challenge. This study aims to describe strategies to recruit and support members from diverse, vulnerable and under-represented communities in hospital-based PFACs. Methods: We formed a team comprising of patient advisors, researchers, physicians and nurses who were involved in all stages of this qualitative study. The study took place within the Hospital Medicine Re-Engineering Network (HOMERuN), a national Hospital Medicine research collaborative that facilitates and conducts multi-center research to improve the outcomes of patients with acute illnesses. We invited PFAC members, PFAC leaders, hospital leaders, and hospitalist researchers from HOMERuN to participate in either a focus group or individual interview. Standardized questions were used to explore the research question. We used content analysis to analyze data. Results: Eighty stakeholders (45 patient/caregiver members of PFACs, 12 PFAC leaders, 12 hospital leaders, 11 researchers) participated in 8 focus group and 19 individual interviews. All participants acknowledged the difficulties of trying to increase the diversity of their PFACs and to make them more representative of the populations of patients admitted to their hospitals. 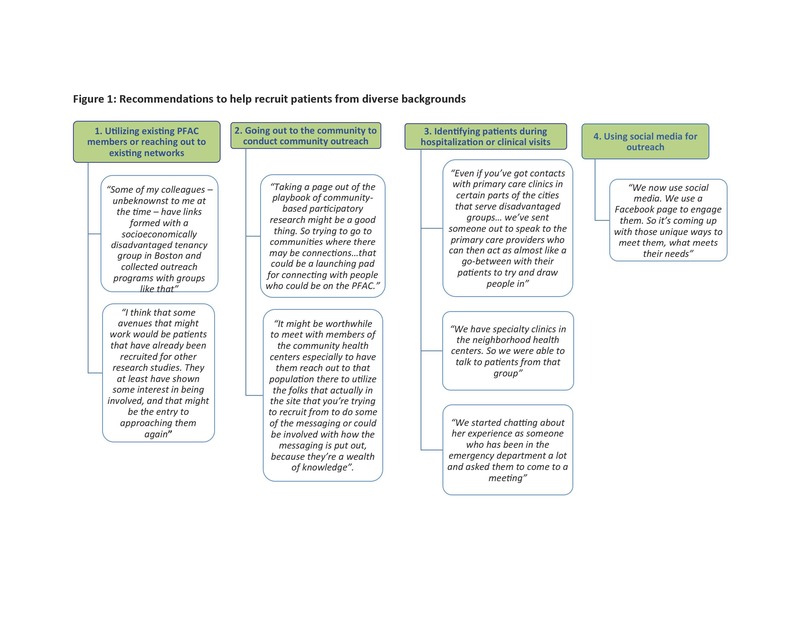 Participants made recommendations to successfully recruit diverse patients, specifically: 1) utilizing existing PFAC members to reach out to their networks, 2) ‘going-out to the community’ to connect with potential members 3) identifying patients during hospitalization or clinic visits and 4) using social media for outreach (Figure 1). Participants also suggested strategies to support the ongoing inclusion of diverse populations. This included: 1) using interpreters and culturally appropriate methods of communication, 2) setting transparent expectations about PFAC membership, 3) equalizing roles between community members and PFAC/hospital leaders, 4) building a sense of community among PFAC members 5) having a diverse PFAC leadership team, and 6) thinking ‘outside the box’ to meet diverse populations needs (Figure 2). Conclusions: Inclusion of under-represented groups remains an ongoing challenge for hospital-based PFACs. PFAC and hospital leaders should venture out into the communities that they seek to engage. PFACs can be operationalized to support the inclusion of diverse community members. Harrison, JD; Fagan, M; Anderson, W; Robinson, E; Schnipper, J; Symczak, G; Hanson, C; Carnie, M; Banta, J; Chen, S; Duong, J; Wong, C; Auerbach, A. PATIENT & FAMILY ADVISORY COUNCILS (PFACS): RECRUITING AND SUPPORTING MEMBERS FROM DIVERSE, VULNERABLE AND UNDER-REPRESENTED COMMUNITIES. Abstract published at Hospital Medicine 2018; April 8-11; Orlando, Fla. Abstract Top 15 Research & Innovations. https://www.shmabstracts.com/abstract/patient-family-advisory-councils-pfacs-recruiting-and-supporting-members-from-diverse-vulnerable-and-under-represented-communities/. Accessed April 22, 2019.